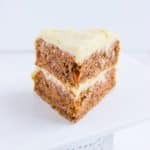 This carrot cake with cream cheese frosting is the perfect cake to serve for Easter. Made with unsweetened applesauce makes this cake super moist. Preheat your oven to 180°C/355°F conventional. Mix the flour, baking soda, cinnamon powder, and salt in a bowl. Set aside. Roast the pecan nuts over medium heat and chop them afterward. Set aside. Add the oil, applesauce, sugar, and vanilla extract in a kitchen machine and mix for one minute. Add the shredded carrots and chopped pecan nuts. Mix in the flour, baking soda, cinnamon powder, and salt until the carrot cake is well combined. Line a 22 cm round cake pan with baking paper. Divide your batter into two parts, using a kitchen scale. Pour one half into your lined cake pan and bake it for 35 minutes in the middle of your preheated oven. Take it out and transfer it to a cooling rack. Line your cake pan again with baking paper and bake the second half for 35 minutes in the oven. If you have two cake pans at home, you can bake both at the same time. Otherwise, it works the best as described above using baking paper. While your cake is cooling down, prepare the cream cheese frosting. Cook the butter over medium heat until it turns light brown. Set aside for 5 minutes to cool down. Mix the butter with the cream cheese in a large bowl. Add the vanilla extract, salt, and icing sugar and mix until you have a smooth cream. Now, place one cake on a plate and top it with about 1/3 of the frosting. Spread it even with a baking spatula. Place the second cake on top and repeat the procedure. Spread the rest of the frosting around the cake until you only see the cream cheese frosting and nothing from the carrot cake anymore. You can decorate it with some pecan nuts. Store your cake in your fridge until you serve it. The carrot cake can also be done one day in advance, but only add the cream cheese frosting the day you will eat it. Store the cake in your fridge and eat it within 2 days.